We're almost ready (one week away?) 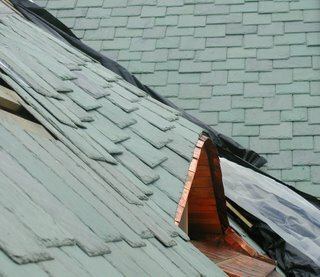 to start slating the entire roof. Just to recap, on top of the timber frame are tongue and groove ceilings. On top of that is a vapor barrier. Then we have 2x10 rafters to create a space for the poly-iso insulation. On top of that are oak battens. And finally, slate. Here you can see the 2x10 rafters that create the insulation cavity (plus some air space above the insulation so the roof can vent properly). If I had it to do over, I think I would have made the entire 3rd floor of our house a simple attic space, instead of living space. 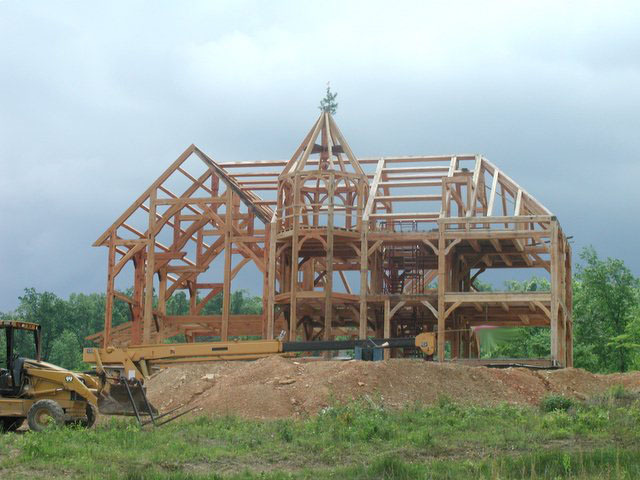 I might have even forgone the timber frame trusses and used simple common rafters on 2 foot centers. It's been a lot of extra work to accomodate catherdral ceilings above this timber frame - almost like building the roof structure twice. I could have used SIPs for the roof (like I did the walls), but even though they would have gone on quicker, they would have been much more expensive and I still would have had to create some sort of batten system for nailing the slate. Oh well, too late to turn back now - I'm happy with the result - just frustrated that the "built up roof" is taking so long. 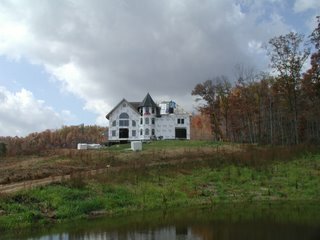 Here's a picture of the whole house as it stands now. There will be a dormer where the blue tarp hangs. The big hole in the front of the house (that looks big enough to drive a car through) is where a bay window will go. Actually, I'd call it a mini-turret, as it will extend 1.5 stories and be faced with stone. The 2 windows above the bay window will allow access (for only limber people!) to a small "castellated" balcony on top of the turret. 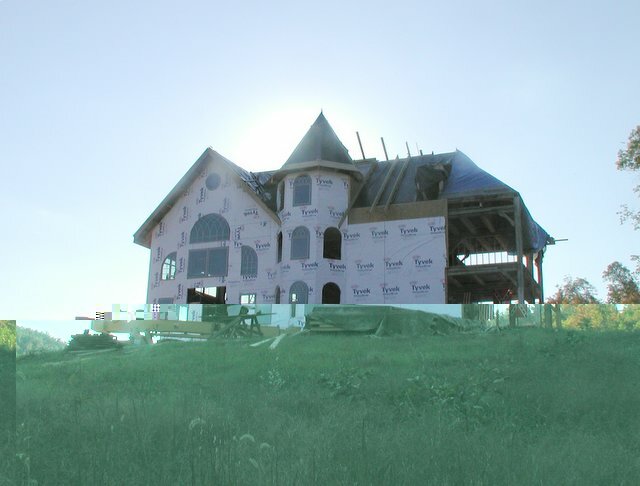 The big white space (devoid of any windows) between this mini-turret and the main tower will eventually have an arched entryway that will frame the main entrance to the house. If I have any energy left at that point, I want to attempt building a "cruck frame" for this entryway. It took about two days for my brother-in-law and I (with a 3rd person cutting and handing slate to us) to slate this doghouse dormer. 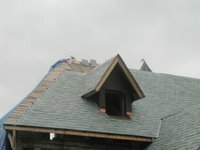 Step flashing the valleys, capping the ridge, and weaving in the field slates on both sides of the dormer took most of the time. 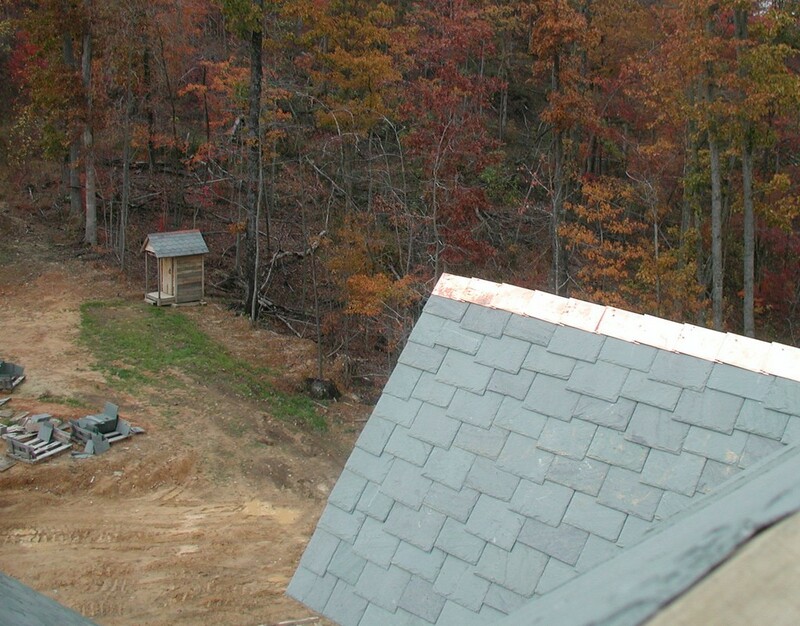 I thought I'd snap a picture of the copper ridge while it is still shiney. Maybe it's the weather here... or the oil from our hands... but the copper tends to turn brownish-purple a lot quicker (a matter of days!) than anything I could find on the internet would suggest. In any case, I can't wait for it to turn green! 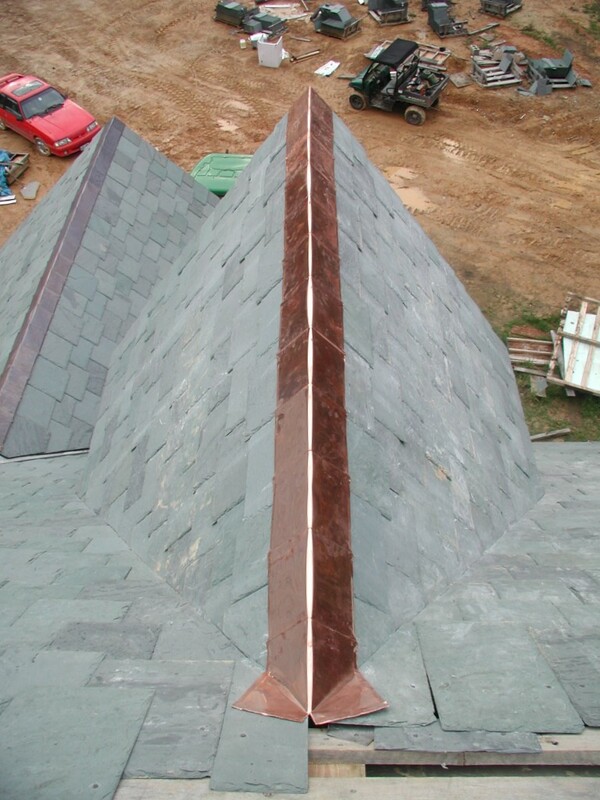 I still have to solder some more copper flashing on to the last piece of ridge cap... so that the rain coming off the main roof will not go under the roof of the doghouse dormer. In the last picture, you can see we've stopped short of the hip of the roof. We haven't yet nailed down skip sheeting on the other side (north side) of this hip, so we couldn't slate the hip yet. Hopefully we haven't boxed ourselves in by laying slate up so close to the hip. The books suggest to start slating at the hips and work outward, but I had to ignore that advice to keep the project moving. The eyebrow dormer is finished!!! I thought this day might never come - the eyebrow dormer is finished and tied in with the rest of the roof. It rained today, keeping us from work, but I went to the house site and my preliminary inspection revealed no leaks so far under the eyebrow dormer! Now we can focus on installing more windows, putting more walls (SIPs) up, and moving on to other parts of the roof. 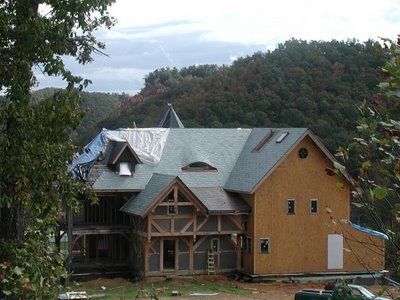 The next area to be slated will be the dog house dormer to the left of the eyebrow dormer. 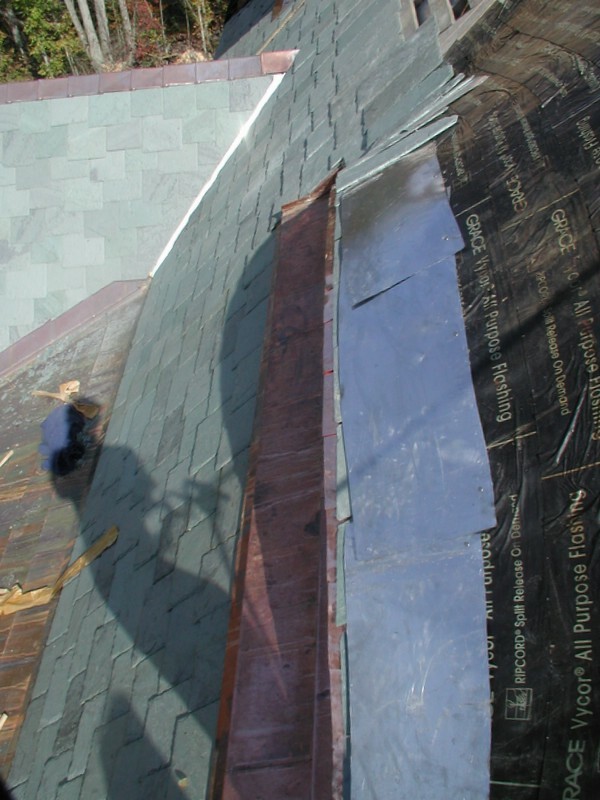 Not nearly as complicated.. we've already snapped chalk lines on this simple dormer and laid a few slates. Notice that the color of the slate looks different in almost every one of these pictures? That's not the camera or some funky computer artifact - it's the way things look in real life! Sometimes you'd swear the slate was all grey, and sometimes you'd swear it was all blue, but the real color is a mix of grey and green. Depending on the sunlight (and clouds and dew), the roof takes on a different hues at different times of the day. That's me in the upper two pictures, using a rope to stay on the side of the roof while I nail down the slates. 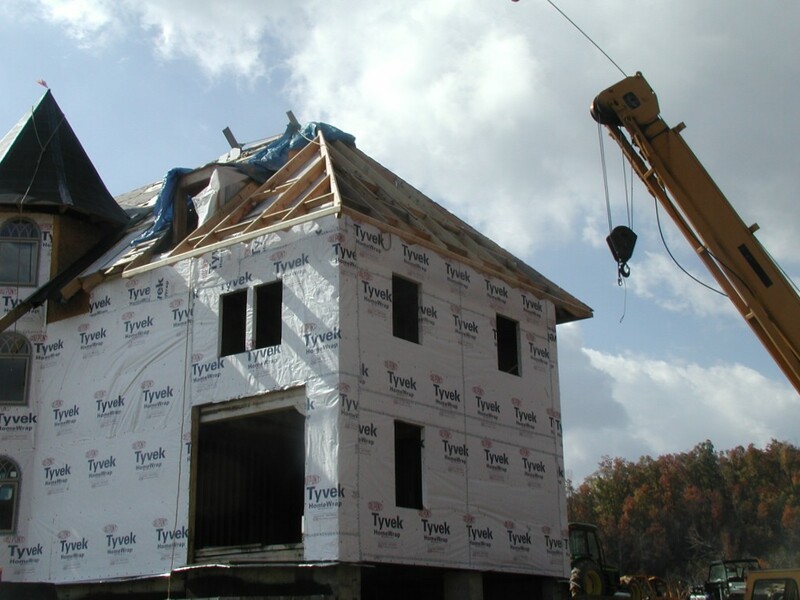 Most of the roof has skip sheeting, making it easy to climb around, but the eyebrow is sheeted solid, making it a better sliding board than a ladder. Ropes are required here. In the left two pictures, you can see the top of the tower in the background... with the little american flag. (the tower has felt because I don't know when we'll get around to slating it). 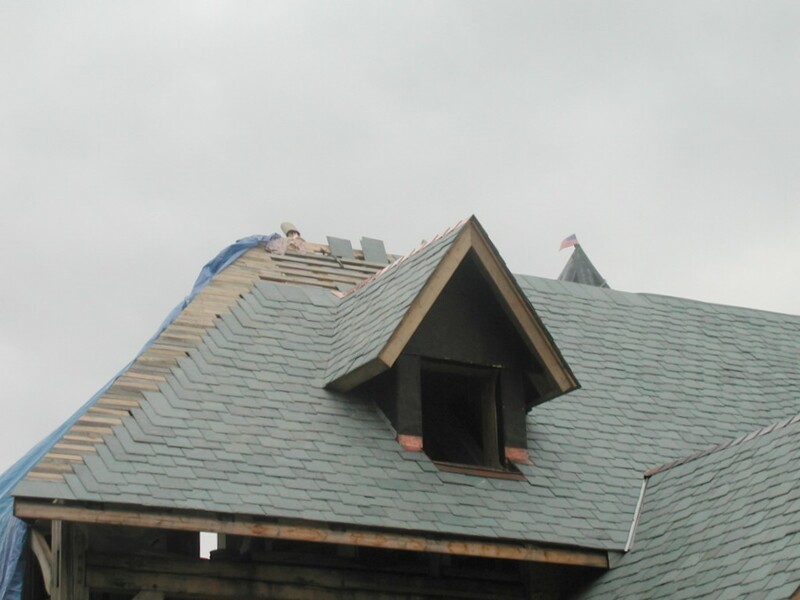 Most of the slates you see stockpiled on the roof, resting between the battens, are field slates that my brother in law was installing on the main roof today while I worked on the eyebrow dormer. I put down 60 small slates at most, while he probably installed at least 200 full sized slates elsewhere (and worked on other things too!). I ran out of terne coated stainless and started using more expensive (and possibly less durable) copper flashing because the roofing supply houses are closed on the weekends and I didn't want to halt work. I'm at a point on the eyebrow now where it's probably flat enough that it wouldn't absolutely require flashing between the courses, but I'm installing flashing just to be sure. Eyebrow dormer - 5 courses complete and picking up steam! 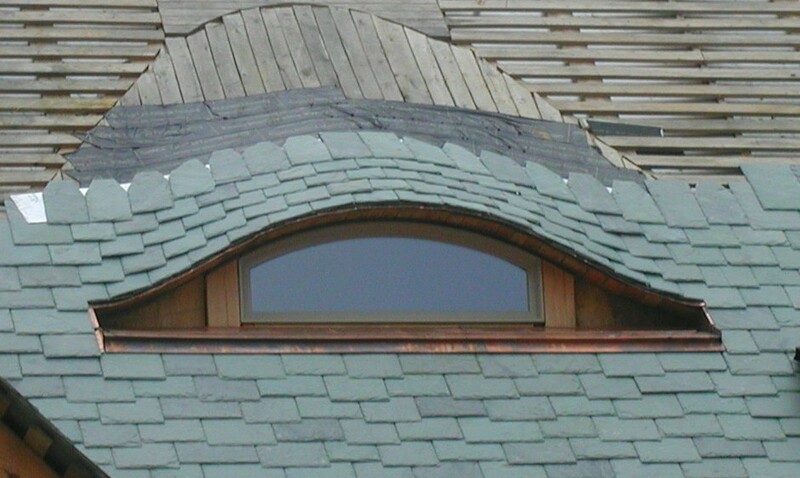 It took me half of today to lay two courses of slate across the eyebrow dormer. (plus about 20 field slates next to the eyebrow) It's taking shape, looking reptilian, and I love it. Each course across the eyebrow has fewer and fewer slates, so it will go quicker and quicker as I progress. It's very exciting to build this part of the roof because I've never seen an eyebrow dormer in real life. After I finish each course of slate, I scramble to the ground and try to imagine what it will look like when I'm done. The first picture was taken leaning out one of the regular (aka doghouse) dormers of the house. 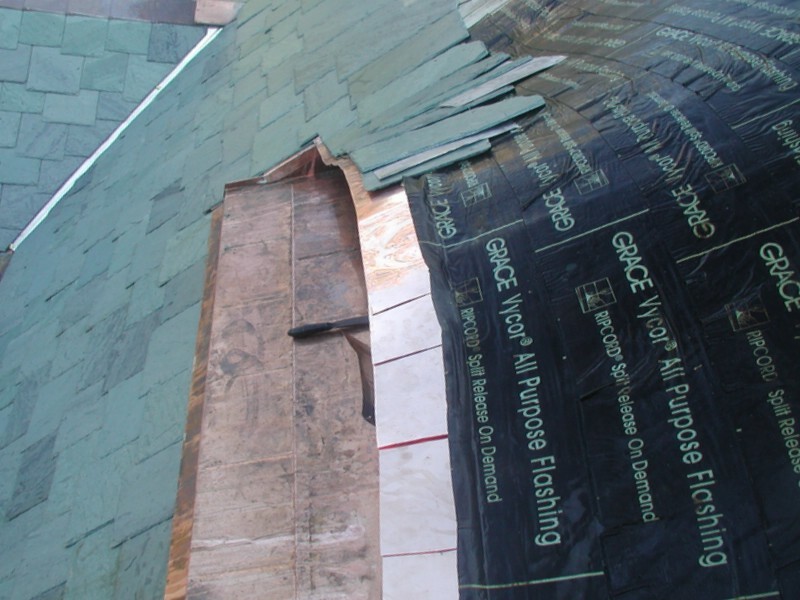 There's usually a helper (a college student studying carpentry) inside the doghouse dormer who cuts the slates to order and hands them out to me. 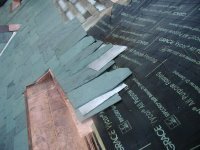 I trim the tops of the slate (with a board and slate hammer) to get them to lay just right, punch the nail holes, and nail them to the roof. I use a rope around my waist and stand on the copper shelf in front of the dormer in order to lay these slates. After I finish about one more course, I'll have to position myself above or beside the dormer in order to nail the remaining courses. 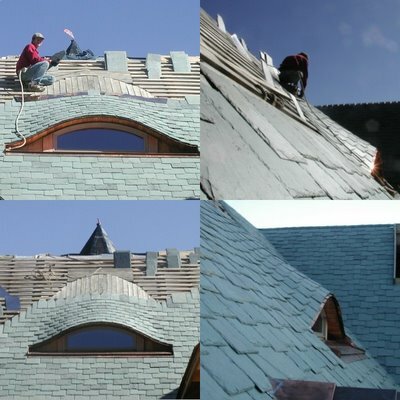 The 8" slates lay flatter on the convex portion of the dormer than they do on the concave portions, even though the rate of curvature is the same. You can probably see why just by looking at the second picture. If I had it to do over, maybe I would use 6" slates in the convex areas, but I'm satisfied enough not to tear off the slates and start over! I'm axious to see if I can get the eyebrow slate courses to run perfectly horizontal (i.e. perfectly in line with the field slates) just before I reach the peak of roof and run out of room. Tomorrow I'll recheck my math before adding anymore slates. BTW, with the prospect of winter setting in on a house without a roof, I've recruited some more part time help. While I'm slating on this side of the roof, there's a crew of "the regular band of in-laws and out-laws" on the other side of the roof, installing polyiso insulation and oak nailers so we can eventually (soon?!) lay slate over there too! 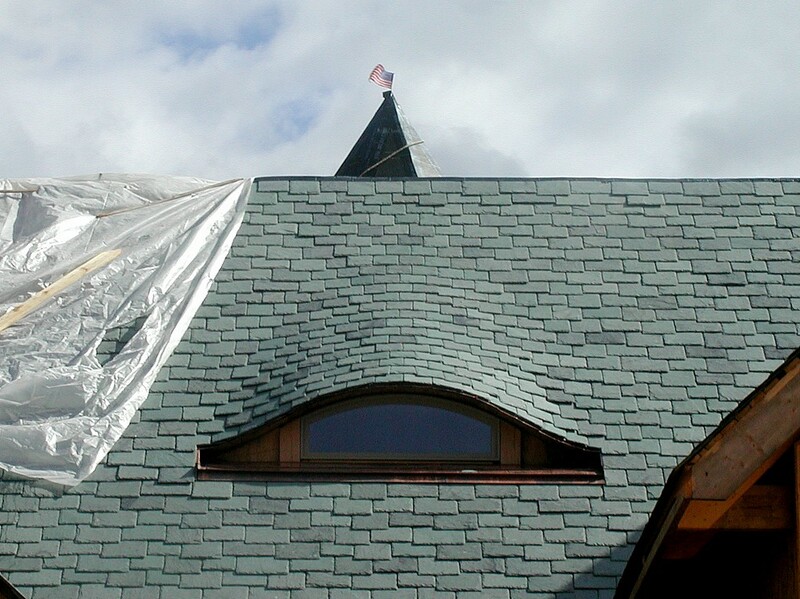 The eyebrow dormer has languished, unslated, on the west side of the roof for weeks. The fact that it was covered with a translucent piece of plastic helped me to ignore it, and the challenge that it presented, as our attention was directed toward the SIPs. Recently though, I've taken the challenge back up, and it feels like I've got a handle on it. The breakthrough came when my wife (shopping for exotic sticky felt paper to cover the tower) happened upon a commercial roofing store that carried terne coated stainless steel. As far as I know, the purpose of the coating is to dull down the mirror finish of stainless, and to make it more solderable (solderability is not an issue for the eyebrow though). 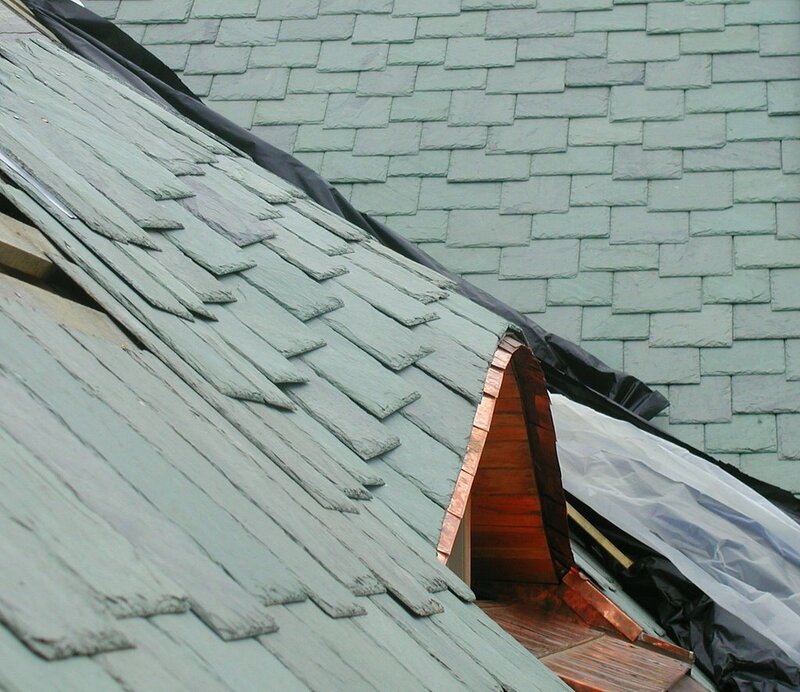 This particular terne coating (TCSII from Follasnbee, as referenced in the slate roof bible) has no lead, so it's a little more shiny than traditional terne coated steels, but definitely less toxic. More importantly, it's thin and "dead soft" so 36"x12" strips of it in .015 thicknesses lay fairly flat, even on compound curves. Normally, you would not flash between courses of slate, as you might with cedar shakes. 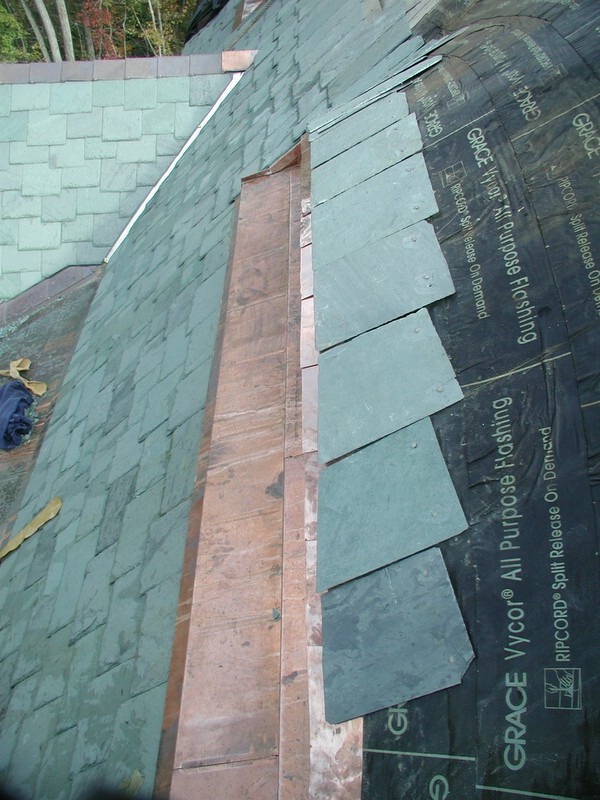 But the slate roof bible recommends flashing between courses of slate when doing eyebrow dormers or slated (i.e. rounded) valleys. This material seems to be just the ticket. I tried to keep the sides of the eyebrow slates lined up with imaginary vertical lines of the main roof. 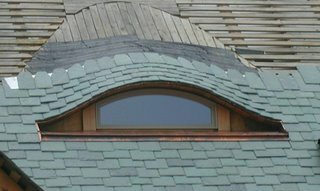 Another variation of the eyebrow dormer (suggested in the Slate Book) has the sides of the eyebrow slates parallel with the changing gradient of the curved portion of the roof. 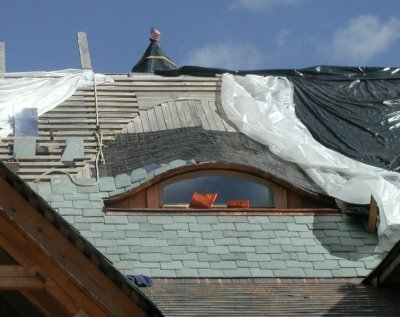 (their variation would be most similar to slating a conical tower top and might make more sense if you were trying to build a waterproof eyebrow without flashing) Their version would have all of your slate butts perpendicular to the flow of water (imagine again, slating a cone shape), whereas the version I chose has the butts of the eyebrow slates parallel with the butts of the normal roof slates. Back to the mundane details for those who care: Over the starter slates (and over each course of visible slates), I am using the terne coated stainless as flashing, careful to cover the heads of my stainless slate nails with the flashing while still holding the flashing high enough so that it won't be visible. (the butts of each subsequent course of slate should just barely cover the flashing that overlaps the preceding course of slate.) 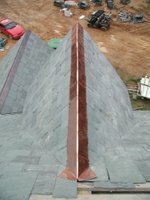 Of course, the pieces of stainless flashing are lapped like shingles themselves, so when water runs downhill, it will run out of, not into, the roof! A few more details, related here in machine gun fashion... Whereas the main roof has 9" to 14" wide slates, I'm using 8" wide slates on the eyebrow, with an occasional 6" or 7" slate thrown in here and there to get things to come out right. It's necessary to cut dog ears into the tops of the slates to get them to lay decently flat on the eyebrow frame. Occasionally I have to cut a trapezoidal slate to keep the slates running like I want. 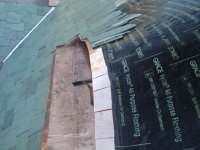 Although it makes luxurious temporary roofing, the Grace ice and watershield is pretty much unneccesary at this point, and somewhat annoying as asphalt resins have leached from it and stained my slate and copper below. I wouldn't want to drink rainwater from a roof that relied on these materials for waterproofing. I anticipate the leaching to stop once the ice and watershield is "dried in" by the slate and stainless. I think the essence of a slated eyebrow dormer is to get a continuous organic form from squares of stone, so that's what I've been trying to achieve with this -- the only eyebrow dormer I'll probably ever build. As I was completeing the 3rd course of visible eyebrow slates yesterday, "S" said to me "that ain't no eyebrow, that looks like a turtle crawling across your roof." That was the best compliment I could have never anticipated.